The U.S. women’s gymnastics team is finally out of their matching Olympics leotards and showing off their fierce personal style on the 2016 MTV VMAs red carpet. Aly Raisman, Madison Kocian, Laurie Hernandez, and Simone Biles took home the gold medal for their incredible performance in Rio earlier this month, and their red carpet looks are almost as sparkly as their Olympic hardware. While their looks all have sequins in common, it turns out these teammates actually have very different taste in fashion. Raisman (left), showed off her incredible bod in a figure-hugging sheer mini with a plunging neckline and floral embellishments. 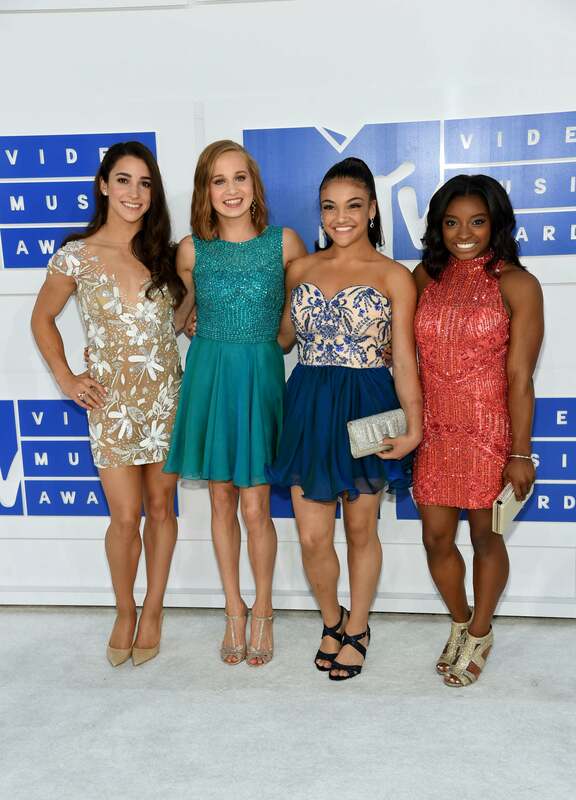 Five-time gold medalist Biles (right) also went with a curve-hugging sheath dress with red sequins and a high neckline that highlighted her toned arms. Meanwhile, Kocian (center left) and Hernandez (center right) opted for A-line styles with full skirts. Kocian looked stunning in a teal frock with a sparkling top and pleated chiffon skirt, while Hernandez slayed in a strapless dress with a sweetheart neckline, patterned top, and flirty skirt. We’re wishing the best for Douglas, and hope that the Fab Four have the incredibly fun night that they deserve. Click through to our gallery to see all the best looks from the 2016 MTV VMAs red carpet.